* On last Sunday I saw about 30 minutes of the match between Aduana Stars FC and Berekum Chelsea in the Round 24 of the GLO Premier League 2010-2011. Unfortunately, the TV signals were weak and eventually disappeared, but I still managed to get impressed with the left-winger / attacking midfielder Daniel Darkwah at Aduana Stars FC. Darkwah showed magnificent control on the ball and was very attacking minded. There is not much information to find about Darkwah but I think he is a former player of Gamba All Blacks FC. Darkwah has been a revelation at Aduana Stars FC this season. The other player who impressed me was the burly Chelsea-striker Bismark Idan (born 10.08.1989) who I presented in my post from 17.11.2010. Idan is such a handful for any defence as he combines power with speed and determination. Idan has scored five league goals so far this season. * Is a new star born at Wa All Stars FC? Striker Tijani Kolawole Lawal scored two goals on Sunday against King Faisal Babes. Lawal is apparently from Benin, although some sources suggests he is Nigerian. Playmaker Frank Nortey Sowah (born 06.05.1991) and Frank Sarfo Gyamfi (4 league goals this season) are also in dazzling form for Wa All Stars FC, a club famous for producing talented players. * Asante Kotoko FC is apparently trying to sign three Ivorian players. The first player is Serge Kouakou (born 02.02.1989), a left midfielder who joined Africa Sports from Denguélé d’Odienné earlier this year. The second player, striker Goué Blagnon, has been a key player for Africa Sports for the last four seasons. He scored two league goals in 2008, ten league goals in 2009 and two league goals in 2010. Blagnon has been part of the Ivory Coast B national football team since 2007. Ben Adama Banh is the third player, a regular defender for Africa Sports from the Ivorian capital Abidjan. I personally think all players have the necessary quality to force their way into the first team squad of Asante Kotoko FC. Petit striker Sadick Adams (born 01.01.1990), the former star of the Ghana U-17 national football team, is apparently on his way back to Ghana and Asante Kotoko FC. Adams has struggled at his Tunisian club Etoile Sportive du Sahel. 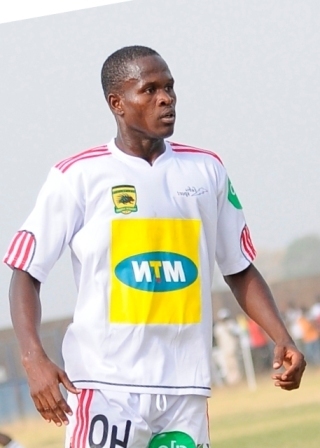 Adams, formerly of AshantiGold SC, could prove to be a sensation at Kokoto if given time. * One of the defenders who get the most positive attention these days is Kweku Andoh at Heart of Lions FC. Andoh, often the captain of Lions, is comfortable at right-back or in central defence. Apparently, league leaders Berekum Chelsea are monitoring the strongman who recently forced his way into the squad of the Ghana B national football team. * Wonderboy Aaron Amoah (born 07.07.1993), presented in my post from 16.10.2010, is arguably the star of Mighty Jets FC but young midfielder Jacob Kwao has performed so well the last couple of months, that he forced his way into the preliminary squad of the Ghana U-20 national team. Kwao is a player to watch. * Stephen Manu (born 21.01.1985) and Fuseini Nuhu (born 20.06.1989), who started the season as the star strikers of New Edubiase United FC, are currently struggling in front of goal. Manu’s last goal was on 24.10.2010 while Nuhu hasn’t scored since 05.12.2010. However, Emmanuel Baffour (born 02.04.1989) has four goals in the last 15 matches and has forced his way into the squad of the Ghana B national football team. Baffour played for Liberty Professionals FC in 2007-2008 and was relegated with Tema Youth FC in 2008-2009, despite scoring at least seven league goals. Attackers: Nathaniel Asamoah (Asante Kotoko FC – DOB 22.02.1990), Emmanuel Baffour (New Edubiase United FC – DOB 02.04.1989), Emmanuel Osei Banahene (Berekum Chelsea – DOB 16.08.1988), Emmanuel Clottey (Berekum Chelsea – DOB 30.08.1987), Bismark Idan (Berekum Chelsea – DOB 10.08.1989), Sadick Adams (Etoile Sportive du Sahel, Tunisia – DOB 01.01.1990). Ernest Sowah has been brilliant all season for Chelsea and is perhaps the best goalkeeper in the country together with the experienced Sammy Adjei – with more than 40 full international matches for Ghana. John Adjetey, who I saw for RTU against Liberty Professionals FC on 10.04.2011, is a newcomer in international football. Amos Frimpong still manages to get noticed despite playing for the very poor bottom side BA Stars FC. Frimpong is often captain of the side despite being a teenager. He is a versatile player, often found on right-back or as a defensive midfielder. I doubt that he will follow BA Stars FC down to the second level of Ghanaian football. Richard Osei Bonsu was a surprise inclusion from my point of view. Bonsu is an attacking midfielder / right-winger who is a very important member of the Arsenal-team. He is a former player of Royal Knights FC and is apparently 180 centimeters and 60 kg. Bonsu is very comfortable on the ball. Michael Amissah Insaidoo is also new to this national team and is a lively right-winger / central midfielder with brilliant skills. I have always considered Insaidoo to be a very exciting player to watch. He is a former player of Liberty Professionals FC. Eric Adjei is the only player on the list at second level of Ghanaian football. He was an important member of the Great Olympics-team that was relegated from the GLO Premier League 2009-2010. I guess the amazing Chelsea-trio of Banahene, Clottey and Idan, who have scored three, ten and five goals respectively, will lead the attack for Ghana B, who will play Sierra Leone on 30.04.2011. The picture is of the brilliant Asante Kokoto defender / midfielder Mohammed Sabato and is taken from http://www.asantekotokofc.org, one of the best club websites in West African football.